The first super tournaments, one open and one closed, are already behind us. In the open, the Tradewise Gibraltar Masters, the ACP provided wild cards for Grandmasters Jakovenko, Gunina, Khotenashvili and Pogonina, and also a special prize for the ACP Premium member who did not manage to win a regular prize in the event. Radoslaw Wojtaszek did not have a great event, but still won this special prize of 689 GBP. In the closed, the Wijk aan Zee Tata Steel, ACP wild cards Evgeny Tomashevsky (Masters) and Nino Batsiashvili (Challengers) took part with moderate success. We are proud of our Premium Member Alexei Dreev, who got a veteran wild card for the Challengers event and shared first place together with two more ACP Premium Members – Adhiban Baskaran and Eltaj Safarli. Congratulations to the winners! Good news for the ACP Members for the upcoming European Individual Chess Championship in Gjakova, Kosovo, to be held from 11 to 24 May. We take this opportunity to thank the organizers and the ECU for the fruitful cooperation and the improved conditions. No less than 10 000 EUR in special prizes will be awarded to the highest-placed ACP Premium Members outside the main prizes. This is a great incentive for participating and becoming an ACP Premium Member just in time! In addition to this, ten players rated 2700+ will be hosted by the organizers in the official hotel free of charge. It is the first time that Kosovo holds such a prestigious event, and we expect it to be organized on a high level. The ACP wild cards are pouring in. 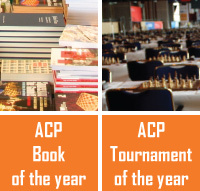 We are proud to list the tournaments in Tbilisi (Nona Gaprindashvili Cup 22-30 April), Porto Mannu (4-11 June), Warsaw (Najdorf Memorial 8-16 July) and Jerusalem (Gideon Japhet Memorial 10-15 July) as ACP Opens, all of which offer excellent opportunities for the ACP Premiums. The wild cards are distributed based on ACP Tour standings and geographical diversity and the deadline for decisions is 15 March, so there is still time to improve your ACP Tour rankings. ACP is working on a ground-breaking project together with the Chess Supersite (www.chesssupersite.com) but we will leave the details for later on. For now, we are proud to announce the launch of the site, scheduled for 27 March, which will be marked with a big online blitz tournament with excellent prizes. This will be the first of the planned 10 online blitz tournaments, which will be part of the Grand Prix with the total prize fund of 30 000 USD. And, as you are probably accustomed by now, the ACP Premiums will have additional prizes to win – the amount allocated for the Premiums will be 5000 USD. After months of hard work ACP published its Grand Survey. It has 60 questions and it includes topics like Rules of Chess, Time Controls, Draw Offers, Anti-Cheating, World Championship Cycle and a lot more. We invite you to take part – it is your opinion that counts! We prepared an English (https://www.surveymonkey.com/r/9C6JBWR) and a Russian version (https://ru.surveymonkey.com/r/GLZ6S3Y) for your convenience. However, all these good news will be in vain if you miss the deadline for the ACP Membership, which is, you guessed it, 1 March. Become a member and help us to help you! We wish you excellent results and chess with confidence!